Economizers for Process Chillers | Legacy Chiller Systems, Inc. Discover how easy it is to improve operating efficiencies of fluid process chiller systems, as much as 50%, by adding an AuraCool retrofit Economizer or installing a new Legacy package chiller with Integraded Economizer technology. Legacy Chiller Systems currently offers an Integrated Chiller Economizer and Retrofit Chiller Economizer solutions to the market. AuraCool is a patented retrofit economizer system that can be retrofit onto any brand process chiller. Normally installed on the chiller return header, were the process fluid is the warmest, AuraCool can reduce energy consumption up to 50% depending on operating conditions. As interest in energy efficiency products has grown, key markets for Economizer Technology include: Data centers, MRI, CT, PET, laser and Semi-Conductor manufacturing. In almost all cases, Economizer Technology offers the highest return on investment when the outdoor ambient temperatures run 5-10 degrees (F) colder than process fluid design temperatures. Integrated Chiller Economizer technology is ideal for the process chiller replacement and design build markets. Legacy currently offers Integrated Economizer Technology on forty air-cooled and water-cooled condenser chiller models. These Integrated Economizer Systems can reduce process cooling energy costs a much as 60%. Integrated Chiller Economizer technology can be used in many climate regions throughout North America and Europe. In early 2009, Legacy Chillers continues Case Studies in several major U.S. and Canada markets. Using data collected from these case studies, Legacy Chillers had developed an MS XL based Chiller Energy Audit Tool to help customers quickly determine savings potential. 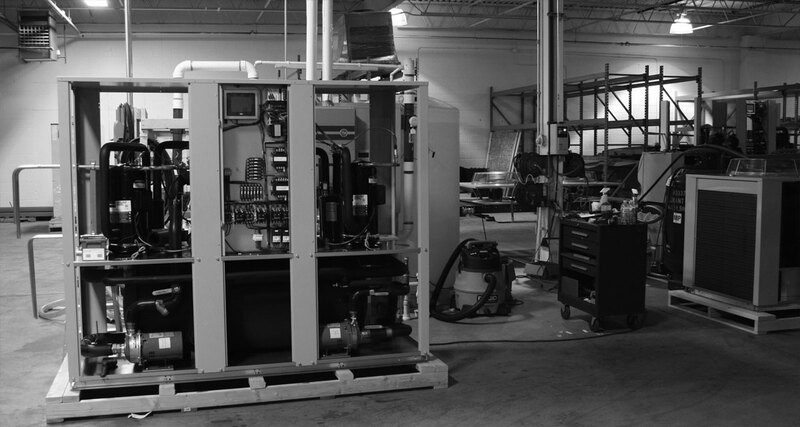 In 2007, Legacy Chiller Systems completed R&D on its Patented Chiller Economizer design. By spring the of 2010, Legacy began integration of Economizer Technology into its PACT,EST and PWCT product lines. The rest is history as the integrated Economizer system quickly proved itself as a cost effective way to save energy. Energy Conservation: In response to ever increasing electrical grid demand, many municipalities have mandated higher efficiencies on most mechanical cooling equipment. With most market indicators trending towards increases in demand for electricity, more than ever before businesses are looking for new ways to reduce usage and carbon emissions. Recently, the Federal Government has put in place significant business tax incentives to encourage investments in more environmentally smart technologies. To see incentives available in your market, visit dsireusa.org. Economizer history: The term Economizer is familiar to the HVAC industry as a process of using a readily available cooling medium, such as outdoor air, to exchange heat at a low cost. The goal of an Economizer is to reduce the need to deploy higher cost mechanical cooling systems that require more electrical energy. Over the years, manufacturers have offered (Air-Side) Economizers as an option when purchasing package air conditioning equipment. Chiller Economizers: Wet-side economizers have grown in popularity over the past decade particularly in the chiller market. Up to a few years ago, Wet-side economizers were primarily deployed on the condenser side of water-cooled chillers to supplement cooling towers. Until recently, application of wet-side economizers on the process side of chillers systems was not widely considered by U.S. chiller manufactures. Our research has shown this mainly had to do with operational challenges that process side deployments posed. Evolution of Chiller Economizers Technology: In 2005, Legacy Chiller Systems commissioned a feasibility study on the application of wet-side economizers for Mission Critical chiller applications. Our study would focus on the use of Economizers specifically on the process side of chillers. The first tests completed on 2006 turned out to be fair at best producing only 10% to 15% KWH reductions. By early 2007, KWH savings had improved to 35% to 60% through the use of a new Economizer controller and specialized software developed by Legacy’s engineering team. In 2007, Legacy Chiller Systems Patented Chiller Economizer Technology and now offers several products lines that take advantage of this revolutionary technology.